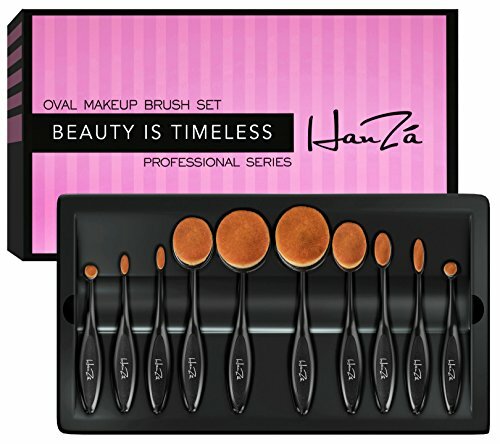 Makeup Brushes by HanZá!! Great Deal!! A COMPLETE 10-PIECE SET - Includes specialized oval brushes for every need & application: Primer, Foundation, Concealer, Powder, BB Cream, Eyeliner, Eye Shadow, Blush, Contour, Highlight, Bronzer, Setting, And All Your Other Favorite Makeup Secrets! WORKS WITH POWDERS, CREAMS & LIQUIDS - These High Quality Brushes Are Universal And Easily Work With All Your Favorite Products To Provide a Streak-Free And Professional Salon Quality Finish. For Face, Lips, Brow, Nose, Cheeks, Chin, Eyes, etc. FLEXIBLE, ERGONOMIC, ANTI-SLIP HANDLES - Uniquely designed with 90° of flexibility for better application and stability without breaking like other brushes. Anti-slip coating & ergonomic contours provide superior grip & produces more precise results.